Each order comes with one assembled and tested shield, a stick of 0.1" male header and a 12mm coin cell. Some light soldering is required to attach the header to the shield in order to plug it into your Arduino. if you want to stack a shield on top, be sure to pick up a set of stacking headers to use instead. We think this is the Ultimate GPS shield and we also think you'll agree! We don't pre-assemble the headers on because there's two options! You can either use plain 0.1" male headers (included with the shield) or Arduino Shield Stacking headers. Most people will be happy with assembling he shield with male headers. The nice thing about using these is they don't add anything to the height of the project, and they make a nice solid connection. However, you won't be able to stack another shield on top. Trade offs! Place the header onto your Arduino, with the long pins down. If you want to go with stacking headers, place the the shield PCB on top of the Arduino and fit the long pins through the pads until they slot into the Arduino. Depending on which version/type of Arduino you may need to use 2 x 8pin and 2 x 6pin or 1 x 10pin, 2 x 8pin and 1 x 6pin. Fit the long pins through the pads until they slot into the Arduino. 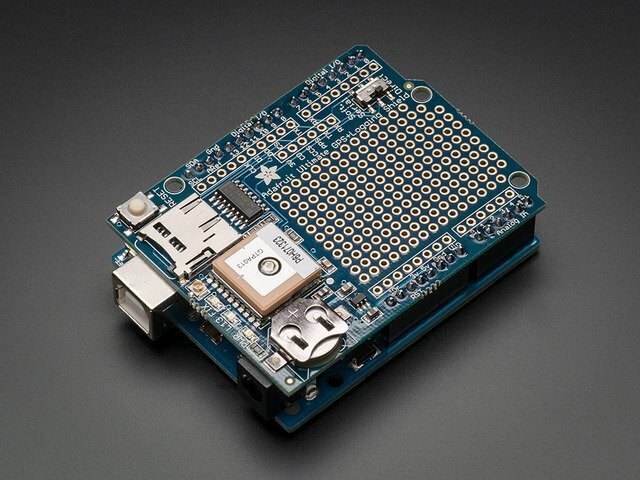 Depending on which version/type of Arduino you may need to use 2 x 8pin and 2 x 6pin or 1 x 10pin, 2 x 8pin and 1 x 6pin. Turn the Arduino upside down so its resting on the long parts of the stacky headers and solder them from below. Select Software Serial on the switch. Connect a wire from the TX pad to digital 0 and a wire from the RX pad to digital 1. This is the raw GPS "NMEA sentence" output from the module. There are a few different kinds of NMEA sentences, the most common ones people use are the $GPRMC (Global Positioning RecommendedMinimum Coordinates or something like that) and the $GPGGA sentences. These two provide the time, date, latitude, longitude, altitude, estimated land speed, and fix type. Fix type indicates whether the GPS has locked onto the satellite data and received enough data to determine the location (2D fix) or location+altitude (3D fix). If you look at the data in the above window, you can see that there are a lot of commas, with no data in between them. That's because this module is on my desk, indoors, and does not have a 'fix'. To get a fix, we need to put the module outside. GPS modules will always send data EVEN IF THEY DO NOT HAVE A FIX! In order to get 'valid' (not-blank) data you must have the GPS module directly outside, with the square ceramic antenna pointing up with a clear sky view. In ideal conditions, the module can get a fix in under 45 seconds. however depending on your location, satellite configuration, solar flares, tall buildings nearby, RF noise, etc it may take up to half an hour (or more) to get a fix! This does not mean your GPS module is broken, the GPS module will always work as fast as it can to get a fix. This line is called the RMC (Recommended Minimum) sentence and has pretty much all of the most useful data. Each chunk of data is separated by a comma. The next 4 pieces of data are the geolocation data. According to the GPS, my location is 4042.6142,N (Latitude 40 degrees, 42.6142 decimal minutes North) & 07400.4168,W. (Longitude 74 degrees, 0.4168 decimal minutes West) To look at this location in Google maps, type +40° 42.6142', -74° 00.4168' into the google maps search box . Unfortunately gmaps requires you to use +/- instead of NSWE notation. N and E are positive, S and W are negative. The one after that is 160412 which is the current date (16th of April, 2012). Once you get a fix using your GPS module, verify your location with google maps (or some other mapping software). Remember that GPS is often only accurate to 5-10 meters and worse if you're indoors or surrounded by tall buildings. You can send $PMTK and other commands from the GPS module datasheet, just type into the serial monitor box. Don't forget you'll need to set Both NL & CR (new line and carriage return) next to the baud rate selection box)! Place the Adafruit_GPS library folder your sketchbookfolder/libraries/ folder. You may need to create the libraries subfolder if its your first library. Restart the IDE. You can figure out your sketchbookfolder by opening up the Preferences tab in the Arduino IDE. Open up the File→Examples→Adafruit_GPS→leo_echo sketch and upload it to the Arduino. Then open up the serial monitor. This sketch simply reads data from the software serial port (pins 7&8) and outputs that to the hardware serial port connected to USB. You can configure the output you see by commenting/uncommenting lines in the setup() procedure. For example, we can ask the GPS to send different sentences, and change how often it sends data. 10 Hz (10 times a second) is the max speed, and is a lot of data. You may not be able to output "all data" at that speed because the 9600 baud rate is not fast enough. In general, we find that most projects only need the RMC and GGA NMEA's so you don't need ALLDATA unless you have some need to know satellite locations. 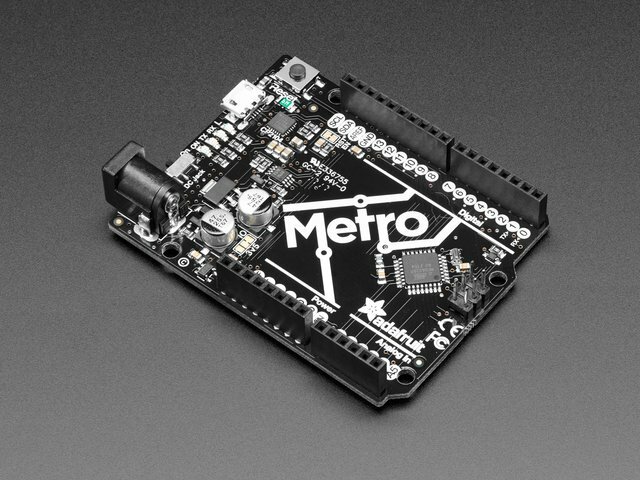 Since all GPS's output NMEA sentences and often for our projects we need to extract the actual data from them, we've simplified the task tremendously when using the Adafruit GPS library. By having the library read, store and parse the data in a background interrupt it becomes trivial to query the library and get the latest updated information without any icky parsing work. and upload it to the Arduino. Then open up the serial monitor. If you're using a Leonardo..
Because due to strange internal-details stuff, we cant use Software Serial, interrupts and also echo the output via USB at the same time on Leonardo. In this sketch, we can either use interrupts and call GPS.read() within a once-a-millisecond timer (this is the same timer that runs the millis() command) or we check GPS.read() in the main loop constantly. Then in the main loop we can ask if a new chunk of data has been received by calling GPS.newNMEAreceived(), if this returns true then we can ask the library to parse that data with GPS.parse(GPS.lastNMEA()). We do have to keep querying and parsing in the main loop - its not possible to do this in an interrupt because then we'd be dropping GPS data by accident. This should make it much easier to have location-based projects. We suggest keeping the update rate at 1Hz and request that the GPS only output RMC and GGA as the parser does not keep track of other data anyways. Finally we get to the fun stuff! Its time to log data from the GPS onto an SD card. First up we'll do a basic test to make sure the SD card system is working. If you are using an Leonardo or Mega, you will have to update the SD card library to add 'SD card on any pin' support. If you have an Uno/Duemilanove/Diecimila, this is not required. Once installed, restart the IDE. Then open up the Adafruit_GPS->shield_sdlog sketch and upload it to your Arduino. in the top of the Setup() function - this will help make debugging easier. And comment out the first one and uncomment the second one. If the SD card was initialized OK, it will read a sentence from the GPS, check the checksum and if its a proper sentence, and then log it. You can also set it so only 'fixed' data is logged - that is, there has to be valid location data. Doing so reduces power usage and saves space but its harder to debug because you don't get the timestamps that are in the RMC sentences. One of the nice things about the GPS module on the shield is the built in data-logger. This basic data-logging capability can store date, time, latitude, longitude and altitude data into a 64K flash chip inside. Its not a high resolution logger - it only logs once every 15 seconds when there is a fix - but for some projects that want to track location, this can be a great low power way to log data - no SD card required! It can store up to ~16 hours of data. and upload it to the Arduino. Then open up the serial monitor. If you have an Uno or compatible you will see the echo'd data. Leonardos will not see the echo data but you should still see a message that says "STARTING LOGGIN...STARTED!" PLEASE NOTE: Asking the Arduino, with 2K RAM buffer to handle 64KB of FLASH data and spit it out from the GPS can sometimes over-tax the processor. If you are having hiccups, check the GPS tool instructions below Copy and paste all the text after the —-'s (starting with $PMTKLOX,0,86*67 and ending with $PMTK001,622,3*36) then paste it into the box located on this page. You can only do this with an Uno/Duemilanove/Diecimila/Mega! Yellow L13 (and SD card access) LED is connected to digital 13, this is handy for telling when the Arduino is bootloading and also will flicker whenever the SD card is accessed. Red FIX LED is connected to the GPS's fix output. When this is turning on/off once a second it does not have a fix. When it blinks once every 15 seconds, the GPS has a fix. All Ultimate GPS shields have a built in patch antenna - this antenna provides -165 dBm sensitivity and is perfect for many projects. However, if you want to place your project in a box, it might not be possible to have the antenna pointing up, or it might be in a metal shield, or you may need more sensitivity. In these cases, you may want to use an external active antenna. Active antennas draw current, so they do provide more gain but at a power cost. Check the antenna datasheet for exactly how much current they draw - its usually around 10-20mA. Most GPS antennas use SMA connectors, which are popular and easy to use. However, an SMA connector would be fairly big on the GPS breakout so we went with a uFL connector - which is lightweight, small and easy to manufacture. If you don't need an external antenna it wont add significant weight or space but its easy to attach a uFL->SMA adapter cable. Then connect the GPS antenna to the cable. There is an output sentence that will tell you the status of the antenna. $PGTOP,11,x where x is the status number. If x is 3 that means it is using the external antenna. If x is 2 it's using the internal antenna and if x is 1 there was an antenna short or problem. On newer shields & modules, you'll need to tell the firmware you want to have this report output, you can do that by adding a gps.sendCommand(PGCMD_ANTENNA) around the same time you set the update rate/sentence output. The real time clock will automatically set itself to the correct UTC time as soon as the GPS gets its first correct signal from a satellite. Without the battery, if the GPS loses power, it will forget the time and has to wait till it gets signal again to reset. But, if you have the battery in, it will keep time even after a power loss. We recommend it highly! Since the GPS module is so small, we had tons of space left over, we turned that into a proto area. Feel free to put any circuitry you'd like into the 0.1" spaced holes. None of the holes are connected. There's also a few breakouts near the SoftSerial/Direct switch. For example, the PPS pin which provides pulse-per-second output when the GPS has a fix. TX and RX - extra 'copies' of the GPS RX/TX pins - the RX pin is 5V friendly. This guide was first published on Feb 18, 2013. It was last updated on Feb 18, 2013.